Today, I wanted to give you my Top 5 list for time travel theories that are from movies or tv shows. Some of them might be scientifically possible and others might be completely fictional, but these theories grabbed my attention for one reason or another. I decided to do this blog post, because my book that will be releasing soon, Vanished: Brides of the Kindred 21, has time travel involved in it. Also as a side note, Vanished will explain how my new series that I am working on, Children of the Kindred, will be able to work. In “Superman: The Movie,” Superman flies around the Earth until he is moving faster than the speed of light, thus traveling back in time. This is visually represented by the Earth appearing to spin backwards. Time travel and its potential for effecting changes on reality is a huge part of the Terminator Universe. By making use of time displacement equipment agents are deployed on missions designed to either ensure, alter, or eradicate the status quo as perceived by the participants at the time. However, the equipment is limited to organic objects, such as humans. Clothes and weapons don’t count. 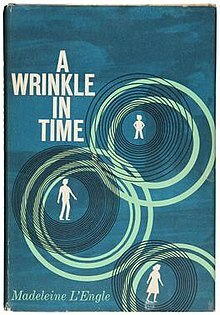 In “A Wrinkle In Time” (2018, based on the book series that started in 1963), time is folded by means of wrinkling time by using a tesseract; and that “the fifth dimension’s a tesseract. In the novel, the tesseract functions more or less like what in modern science fiction is called a space warp or a wormhole, a portal from one area of space to another which is possible through the bending of the structure of the space-time continuum. This meaning may or may not be loosely related to the mathematical notion of a tesseract, a shape analogous to a cube in a space with four spatial dimensions. Many of you have probably heard about Doctor Who or at one point or another. Part of that is probably because this tv show has been around for a long time (1963-present) or maybe you love one of the actors who have played the Doctor during one of its many seasons. The show centers around the Doctor who explores the universe in a time-travelling space ship called the TARDIS which is a blue British police box that was a common sight in Britain in 1963. TARDIS (Time and Relative Dimension in Space) – a time machine that travels by materialising into and dematerialising out of the time vortex. Outside observers at the departure point see the TARDIS vanish, and those at the destination see the TARDIS appear from nothing. If you have seen the Harry Potter movies, you might remember in Harry Potter and the Prisoner of Azkaban, Hermione uses a Time-Turner to attend more classes and exams than would be physically possible. A Time-Turner allows for limited time travel; turning the Time-Turner over once causes everyone within the attached chain to go one hour back in time. It also appears that it allows for some control over where in space they will appear. So what time travel theory is your favorite? Let me know in the comment section below. I used a combination of several theories in Kindred 21, Vanished. Have a look at the book trailer (below) for clues! If you have not yet signed up for my e-mail newsletter, then you are missing out on some FREE eBooks from me plus news on my upcoming books. Also, if you enjoy this blog, then become a subscriber of my blog by entering your email address at the form HERE. I’m a definite fan of the time turner. There’s always been that feeling that there just aren’t enough hours in the day to do all that needs doing. I can only imagine what all you might be able to get done if you had one. In the wrong hands though, it could be devastating. I loved your clock graphics on the video!! I am totally 100% in love with Diana Gabaldon’s Outlander Series and the standing stone theory of time travel- I do think beings from outer space positioned them for a reason. I also love how your books follow family bloodlines and their specific abilities and you’re incredible descriptive ways- I can taste the flavors and see the colors your books are amazing!! My two favs are the Harry Potter “Time Turner” and Madeleine L’Engle’s “Wrinkle In Time” or worm hole. I think I’d use #1 Harry Potter “Time Turner” because frankly, the others scare the crap out of me. If there is such a thing as the butterfly effect, I would be afraid to do even one little thing because it might change the world for the worst. Star Trek (the original series) uses a spin on Theory # 5 in their time travel back to 1940’s and then to 1960’s Earth. In fact, IIRC, most of the Star Trek Universe/Multiverse attenuates the ‘warp factor’ and gravitational ‘well’ of our Sun to initiate both reverse and forward time travel. If you have a basic understanding of a Klein bottle (magnetic folding of graviton fields to moderate/control matter-antimatter reaction) then you could see how the theory could “hold water.” Personally, I’m thinking that the basic particles of space, dark matter and all could be explained by gravitational particles of ‘null’ charge. They all have merit, maybe write a book on each???? One of my favorite time travel theories is from “A Sound of Thunder”, 2005, based on a Ray Bradbury short story. In it, the past timeline is disrupted and adjustments to the future/our present timeline comes in waves. Starting with simple organisms, each subsequent wave affecting more and more complex organisms; until the entire timeline is adjusted. One of my favorites is from an episode of Star Trek: Voyager. In it, the ship is destroyed, with Chakotay and Harry Kim as the only survivors. Fifteen years later, they have the technology they need to send a message back in time to warn the captain. After the crisis is averted, Harry receives a message from his future self, and Harry is left wondering how it’s possible to receive a message from someone who will now never exist, since that timeline has been destroyed.